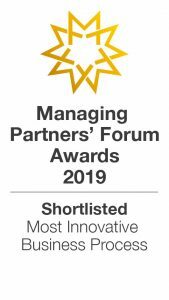 Top 20 accountancy and business advisory firm Kingston Smith is delighted to be named finalist for Most Innovative Business Process in the prestigious Managing Partners’ Forum Awards 2019. The high-profile competition, organised in conjunction with The Financial Times and Harvard Business Review, highlights Kingston Smith’s contribution to operational excellence in professional services firms. Following hot on the heels of Kingston Smith’s recent win for innovation at the British Accountancy Awards, this coveted prize reinforces the firm’s reputation for combining creativity and technological savvy into a practical effective application.